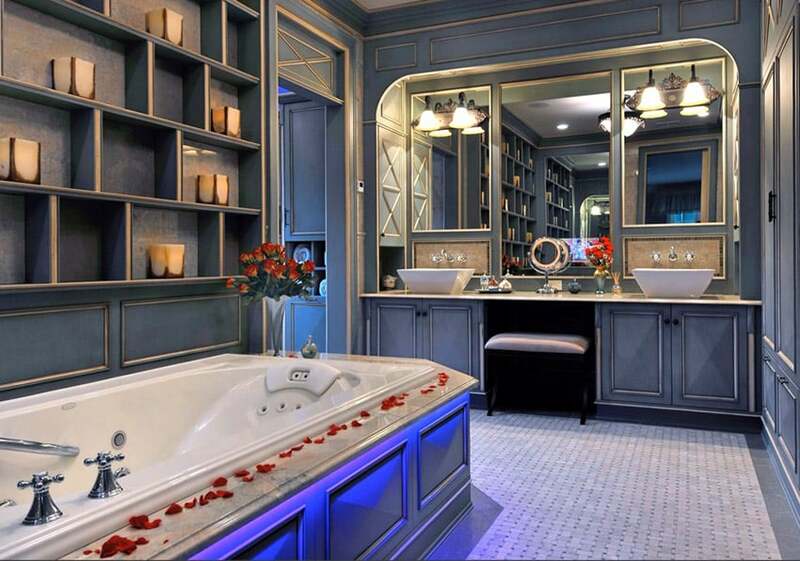 Welcome to part 3 of our luxury bathroom design ideas gallery. 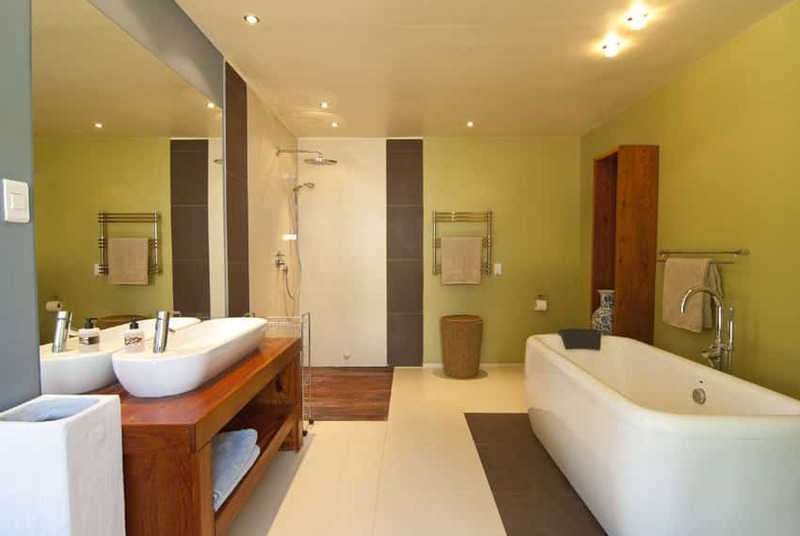 (Click here for Bathroom Designs Part 1 or Bathroom Designs Part 2) Below we share interior designs for contemporary, modern and traditional bathrooms. You’ll see a variety of layouts featuring different types of floor and wall tiles, as well as enclosed and free standing bathtubs to help you find the style that’s right for you. 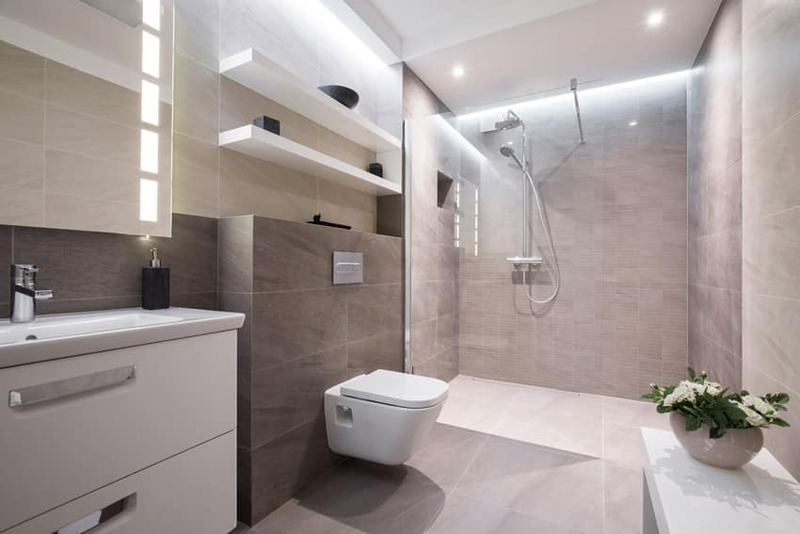 This modern bathroom uses minimal materials as finish, but creates a simple and appealing result. The tiles used are natural stones in a rust-colored brown shade, on both the floors and the walls. – the walls using narrower cuts of tiles compared to the standard 60×60 used on the floors. The double vanity consists of a block of cream-colored quartz with two vessel sinks fashioned out of the same quartz material. This luxurious bathroom combines traditional materials and elements with more modern materials, updating the look and enhancing its appeal without looking uncoordinated. Most architectural details retains its original – white marble floors, wood cornice and paneling, along with the classic paneled doors used on the vanity, traditional area rug, as well as the fabrics used on the furniture and curtains. The update on the classic charm of this bathroom can be seen on the walls. The original wallpapers were replaced by more modern ones – a faux concrete wallpaper with textured finish, and brown natural stone tiles in favor of marble. 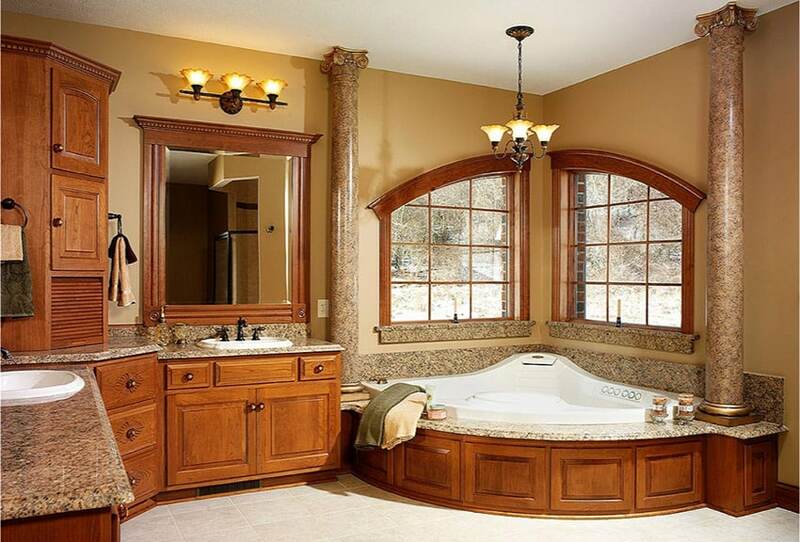 The combination of modern & traditional elements converge and create this beautiful bathroom. 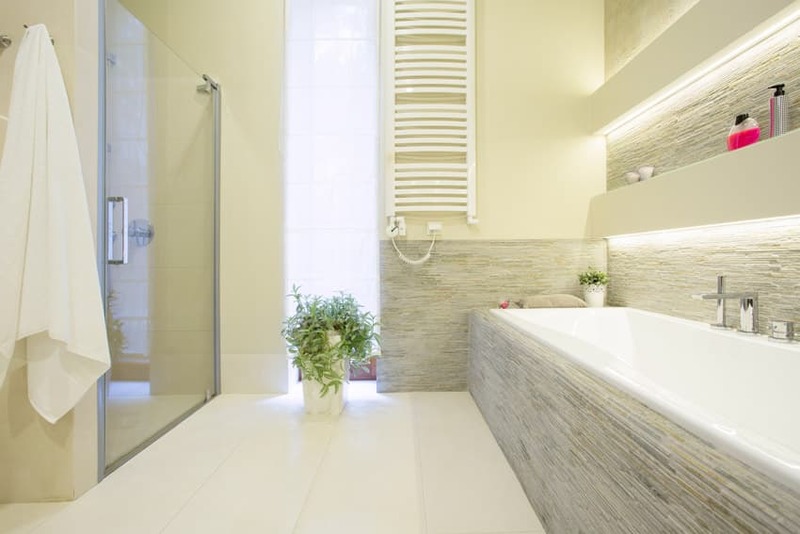 Clean lines and shiny surfaces present in this bathrooms makes it undeniably very modern in aesthetic, but choose more organic colors to give it a warmer, more welcoming appeal. Floors uses beige-colored polishes tiles, while the walls uses a more mauve-toned brown tiles. The vanity cabinet is very simple with straight, hard edges, topped with cream-colored quartztite counters with under-mount sink. The bathtub adds a bit more texture as it uses mosaic tiles instead of normal ceramic tiles for its cladding. 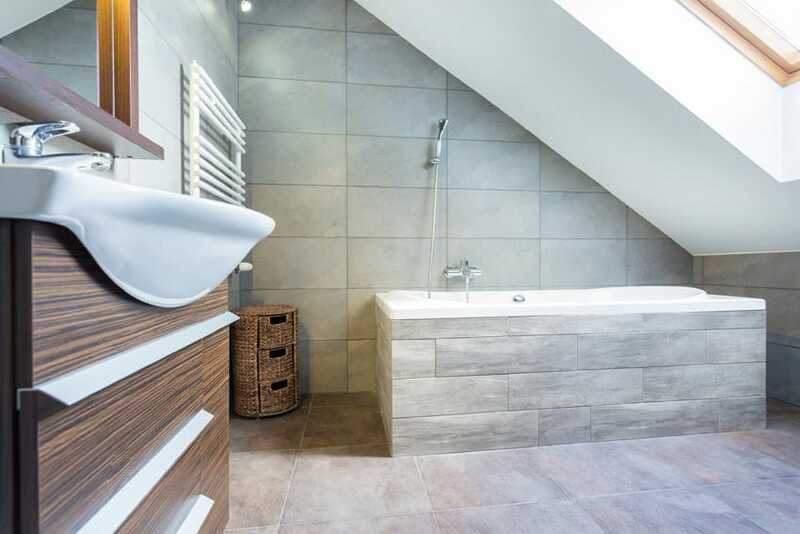 The simple luxury of a skylight brings life into this simple bathroom. 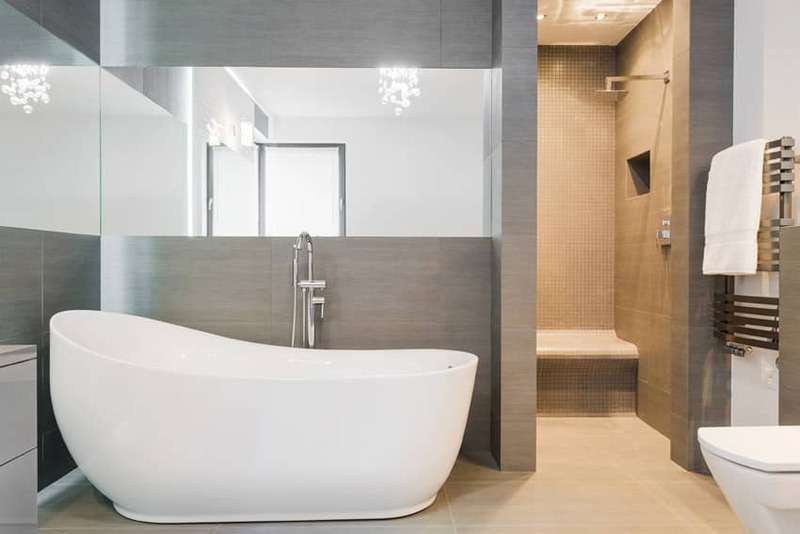 Most materials are simple – gray tiles on walls, textured floor tiles with gray and red tones, and faux wood tiles in gray for the recessed bathtub. Adding more texture and warmth into the bathroom is the use of zebrawood laminates for the wall-hung vanity, wood-framed ledge and frame for the mirror and the simple round rattan storage at the side. This modern bathroom derives its beauty from its simplicity. The elements used are simple, but the varying textures gave it life. On the outside, the first part that could be seen is the bath tub section. 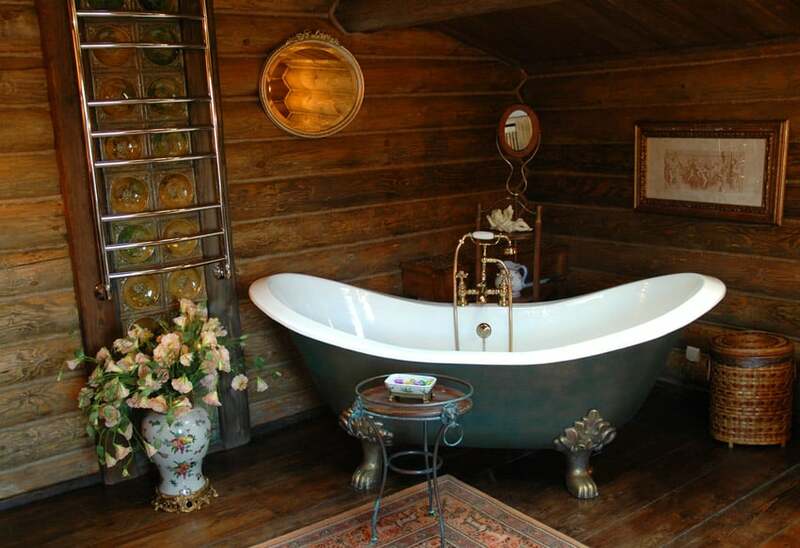 It is covered in fauxwood gray tiles, with a large mirror horizontally placed on one side, directly above the bath tub. Further inside on the right side, the shower section could be seen, where the walls on one side are covered with fauxwood copper tiles, while the other side is covered with copper mosaic tiles. This wall curves outwards at about 1 foot from the floor to create a seating space while in the shower. 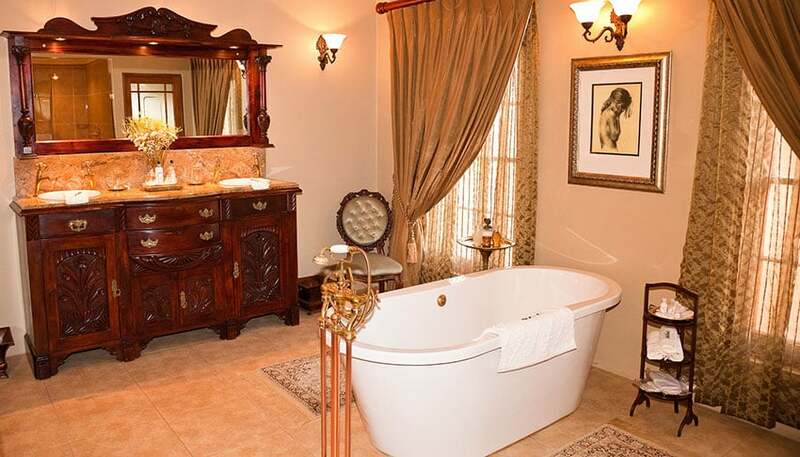 This bathroom makes use of traditional elements to create a classic feel. The floors and walls are covered with treated wooden planks in an oakwood finish with accents of glossy circular patterns lined vertically beneath the towel rods. The bathtub on the other hand is covered in a deep green matte finish with worn out golden accents, a match to the golden frames of the mirrors and photo displays hung on the wall. To give more life to the flooring, a traditional carpet is placed on top of it. 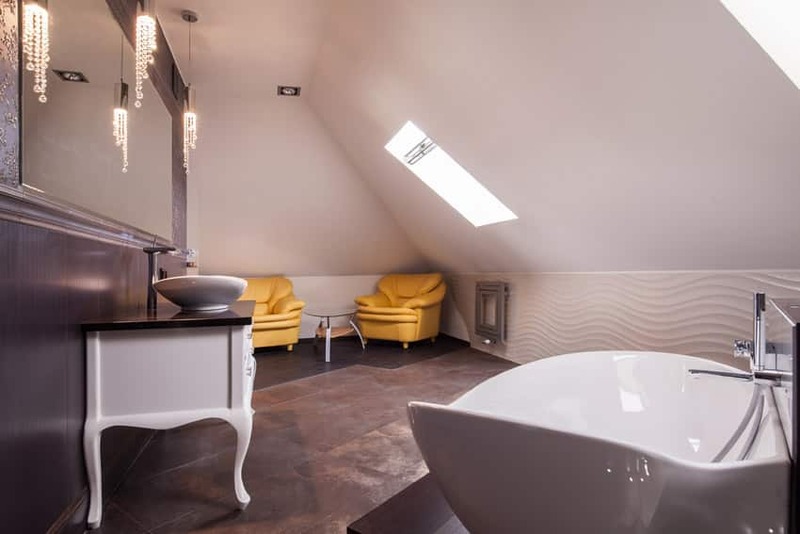 This skylight bathroom makes forth a good lounging area, aside from its function as a bathroom, with seats and a coffee table placed on the far side of the bathroom. The floors are grand with its copper matte finish. The wengue wood finish on the wash area perfectly matches this color. The wengue stained wood covers the wall and is topped with a grand mirror with yellow pendant lights. The yellow light matches the one-seater sofas that add color to the mostly neutral colors. the room is mostly white though, as the cabinet, sink, tub, and textured walls are all covered in a solid white color. 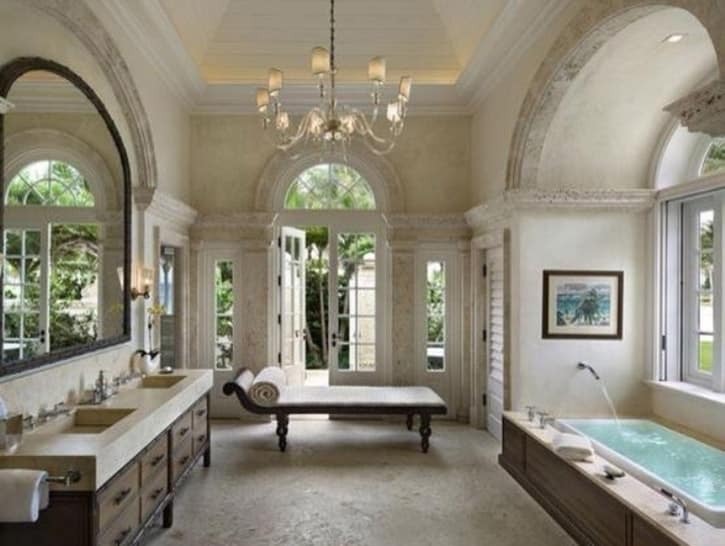 This classic bathroom is spacious and filled with traditional elements. Nature and elegance combine with the wooden pillars that support the right side of the room, washed out wooden planks also cover one part of the wall. Elegant pieces like a golden chandelier with white lights and accents, a huge wooden door with square patterns in a golden oakwood finish, and a grand golden curtain covering a high window panel. A traditional but eccentric bath tub with a solid white color but a textured outer layer with a classic metal seal lies in the middle of the bathroom. 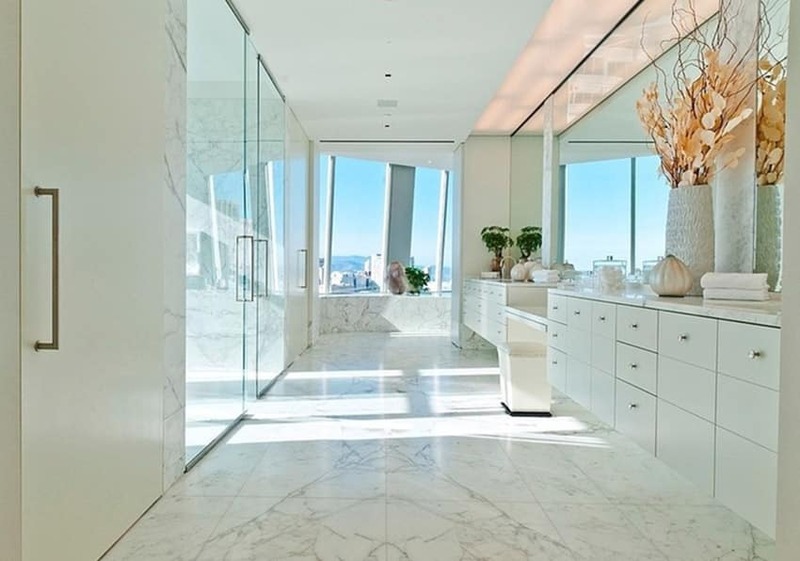 This beautiful white bathroom is done mostly in white, with beautiful marble tiles that cover the walls and the floor. The texture on the marble tiles give a a unique touch of class and beauty to the room. The cabinet, countertop, and bathtub are all in solid white, like the blinds on the windows. Metal pieces on the faucet, shower, towel holder, and mirror accentuate the mostly white room, and a bouquet of flowers give life to the uniform color scheme. This gives a mix feel of modern and natural with its use of materials and colors.The cabinets are seamless and simple but highly functional with an golden oakwood stain. The walls are mostly covered in a solid and relaxing pastel lime green color, which compliments the natural feeling that the wooden cabinets give. The floor tiles are covered in blocks of cream, black, and fauxwood tiles. While the shower area’s walls are covered with tiles of the same color scheme too. The solid blocks of color add accent to the room and even add a modern vibe to the natural colors. 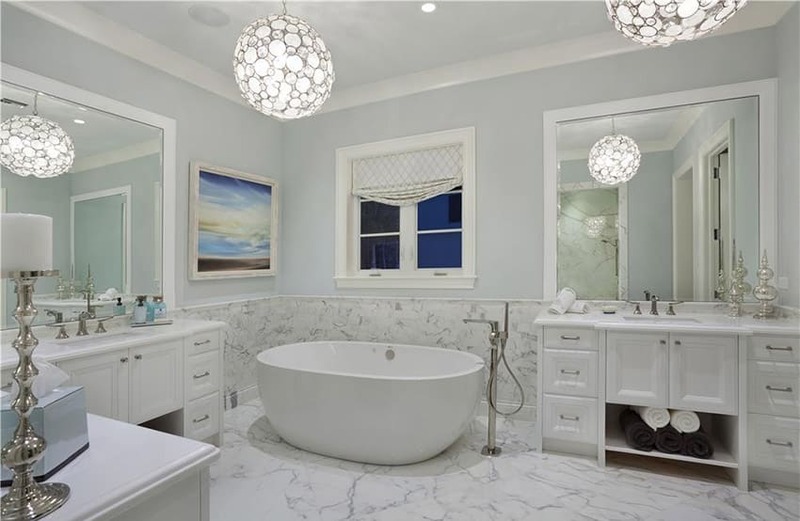 This beautiful bathroom gives a very clean and pure feeling with its mostly off-white color. The walls and flooring are in solid off-white, and the bath tub and some parts of the wall on its side are covered in a matte stone cladding. The matte texture further gives a dry and clean feeling inside this bathroom space. On the opposite side, a glass door separates the shower area from the rest of the room. Green plants in white pots are used to accentuate and give color to this bathroom. This bathroom makes very neutral colors, but has played well with texture to achieve its unique and playful style. The walls are covered in solid gray, and the cabinets and window framing are in solid white. The countertop has a solid grainy brown stone laminate, while the flooring is covered with tiles of a close shade, but of a different texture. The shower area is covered by a glass panel, and a half-wall divider on one side. The flooring inside the shower area is covered in mosaic tiles in shades of brown, gray, black, and white, while the walls inside the shower area are covered with textured gray tiles. This bathroom is simple, chic, and modern with its gray and white color scheme. the shelves, cabinets, and toilet are all in solid white color, while the tiles that cover the walls are in varying shades of gray and light brown. This bathroom’s style comes from the different textures that the sizes of the tiles create on each side. The matte light brown tiles are smaller in the shower area, creating a mosaic feel, while the tiles are larger in the toilet area. Lastly, what gives life and beauty to this bathroom the ample lighting that the led lights provide. 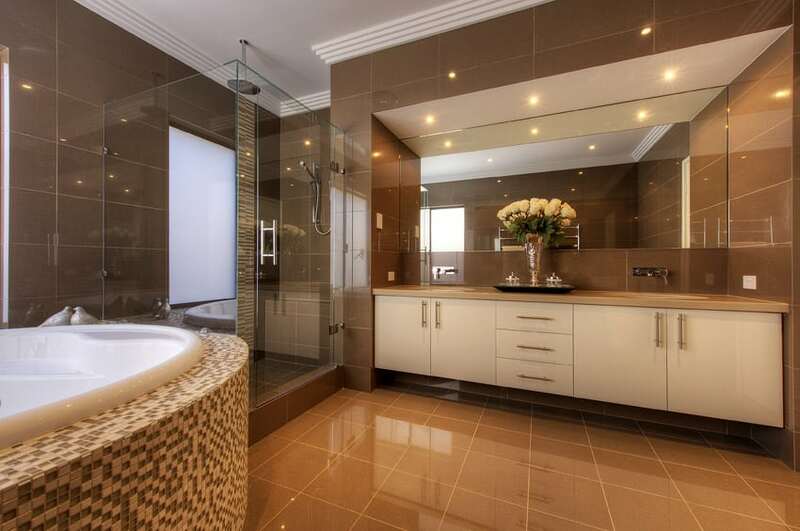 This elegant bathroom is surrounded with warm tones of gold and brown. The bathtub lies directly in between two windows adorned with golden curtains, a good match to the faucets and cabinet handles in the room. The was area is made of wooden cabinetry in cherrywood stain with intricate carvings and golden accents, while its countertop is covered in brown stone. The floor is covered with oatmeal-colored tiles and two small carpets on both sides of the bath tub, to keep the room dry and clean. 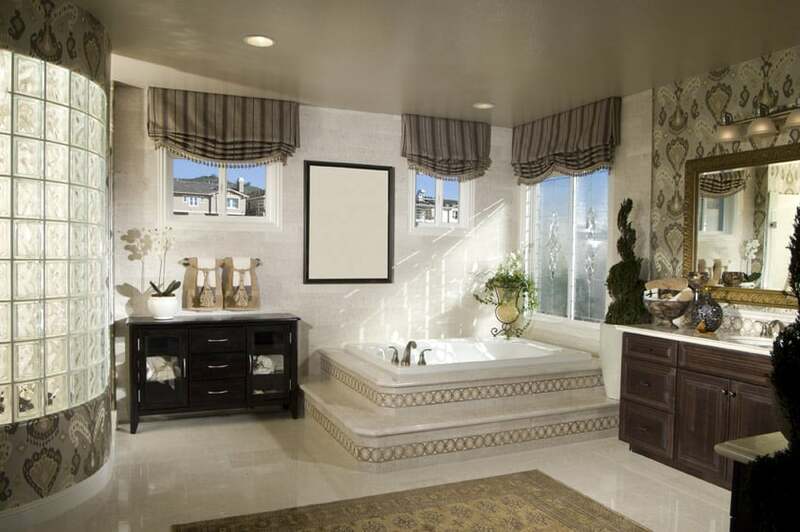 This outdoor bathroom is placed inside a bathroom enclosed in glass panels and pillars in a solid khaki color. The bath tub lies horizontally at the center, overlooking a simple outdoor landscape outside, The flooring has khaki tiles in matte finish that match the color of the pillars. 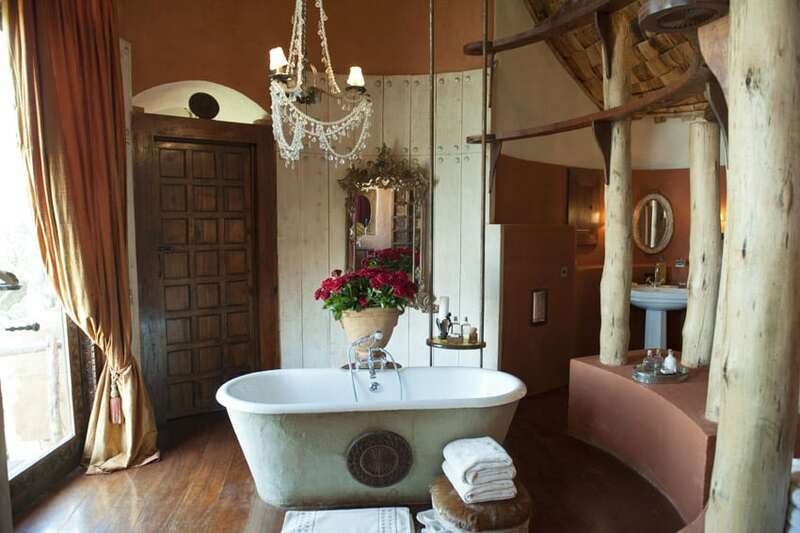 The room is simple but highly functional, where a two-layered wooden wengue table is placed right beside the tub to hold toiletries. This classic bathroom is filled with simple but traditional elements that has a classy but unisex vibe. Although the room is filled with patterns and traditional pieces, a man will not feel out of place here, with the straightforward gray, black and white color scheme that it has. The gray curtains are adorned with dark stripes, while the cabinets are in wengue and deep oakwood stain. The bathtub is surrounded by two levels of platform, providing more place for sitting in the area. Each platform is adorned with diamond patterns that are closely placed beside each other. The rest of the room is adorned with paisley patterns in gold, gray, and black, and glass. This modern bathroom creates a modern space with a good use of geometry and textures. Big rectangular windows lie right next to the rectangular white tub, overlooking the city. While all walls are covered in a solid gray finish, the one-seater couch , flooring, and wash area are in brown, in varying finishes. The couch is neatly covered in a brown leather finish, while the flooring is adorned with weaved patterns. The wash area on the other hand is covered with solid wood laminates. More edges and shapes could be found on the silver and black stands that hold the vases and the rectangular glass pieces hanging at the end of the chandelier. This custom bathroom design creates an illusion of space despite the small space with the use of big windows and mirrors. The white bath tub lies on an elevated platform that is covered with solid wood laminates with vertical patterns while the rest of the flooring is covered with weaved patterns. The wash area has a solid fauxwood finish for the countertop with seamless white cabinetry beneath it. On its side lies a small vanity table with its own mirror and a seat in gold framing and black upholstery. This traditional master bath and powder room offers the perfect spa-like retreat for applying make-up and getting dressed. The beautiful cabinets are finished in a creamy off-white color and afford plenty of opportunities for storage. A nice touch is the light blue satin ottoman in the center of the room which provides a sense of luxuriousness to the space. Some standout features of the room include detailed crown molding, glass chandelier, intricate wall sconces, and amazing Arabescato Statuary Marble flooring. 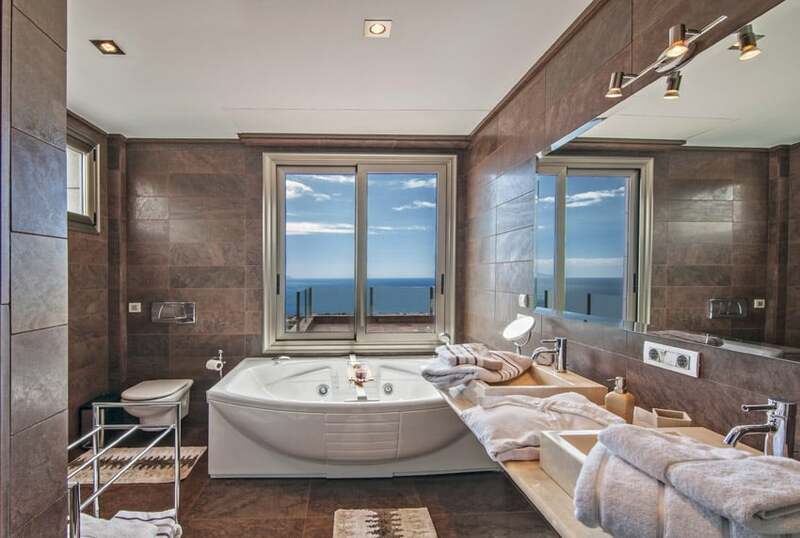 Luxurious master bathroom with amazing oceanview. The large rainfall shower features a frameless enclosure with a great view of the outdoors. The beautiful flooring is made from Sahara Gold polished marble. Luxury penthouse bath with a clean white look with a custom glass shower enclosure. The cabinets are a European style from Dura Supreme cabinetry from a high pressure laminate material. The gorgeous flooring is a Pental Calacatta Caldia polished marble and provides a real sense of elegance to the space. One of the first things one notices in this master bathroom are the whimsical round globe pendant lighting and the attractive 59″ Keren Acrylic Freestanding Tub. 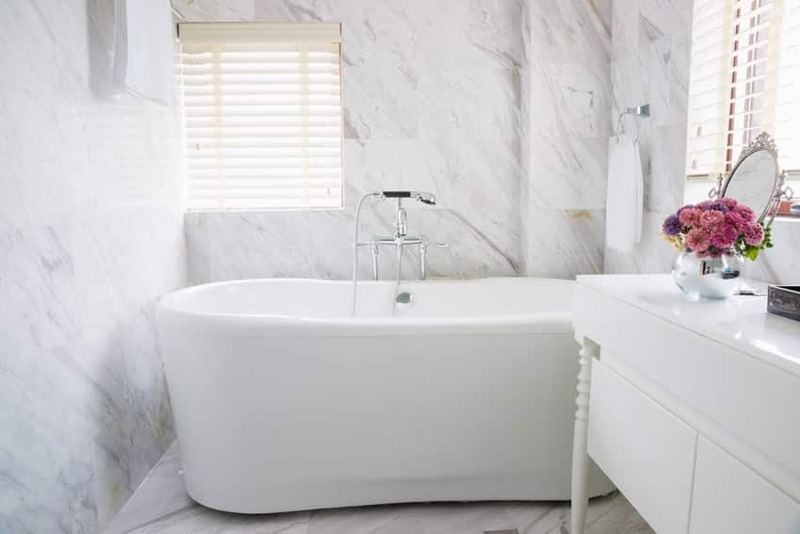 The bath is surrounded by Arabescato Statuary Marble, while the white cabinetry ha a surface of Thassos White Marble. Large framed white mirrors and a small window over the tub help to brighten and enlarge the rooms space. 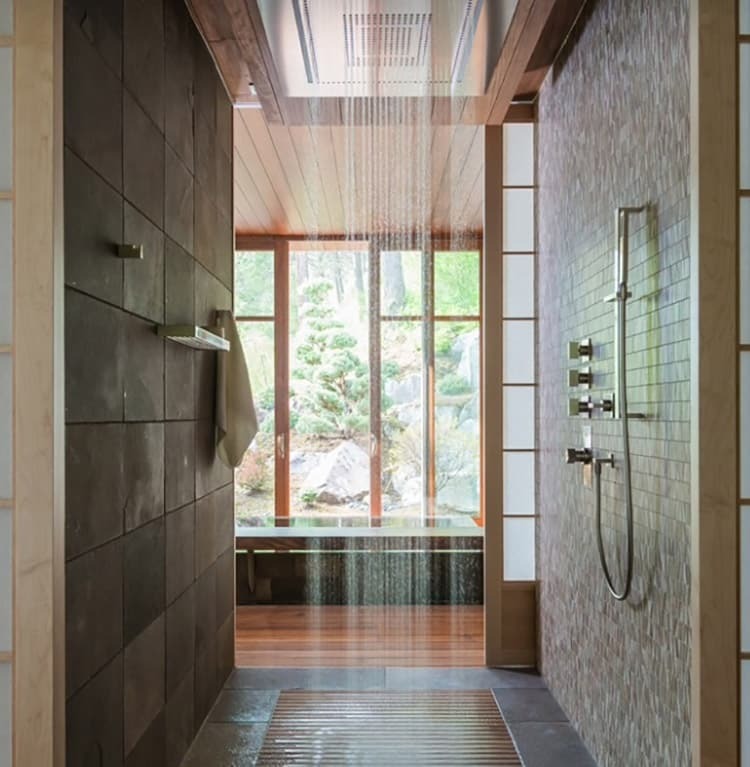 The shower in this contemporary master bathroom is a thing of beauty. It has two types of tile including a Daltile City View Neighborhood Park porcelain tile on one wall with a Daltile Clio Nox mosaic tile on the other. The flooring mat is crafted from teak wood and the large waterfall shower is equipped with a colorful LED rainfall shower head. Contemporary master bathroom with Salerno porcelain tile bath enclosure and slate flooring. The walls are painted in a bright Bluebell color and the cabinet is topped with a large rectangular Qaurelo vessel sink. 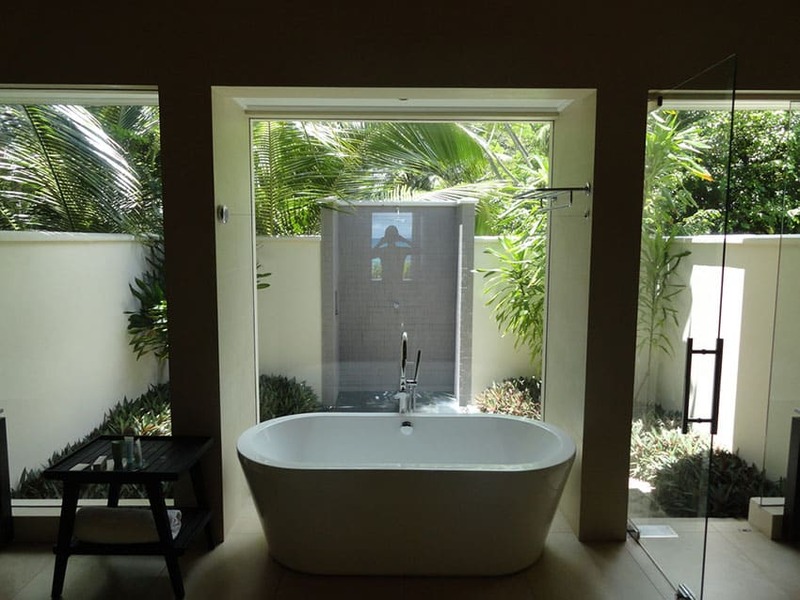 The relaxing whirlpool bathtub is set against the far wall and offers a sweeping view of the backyard area. 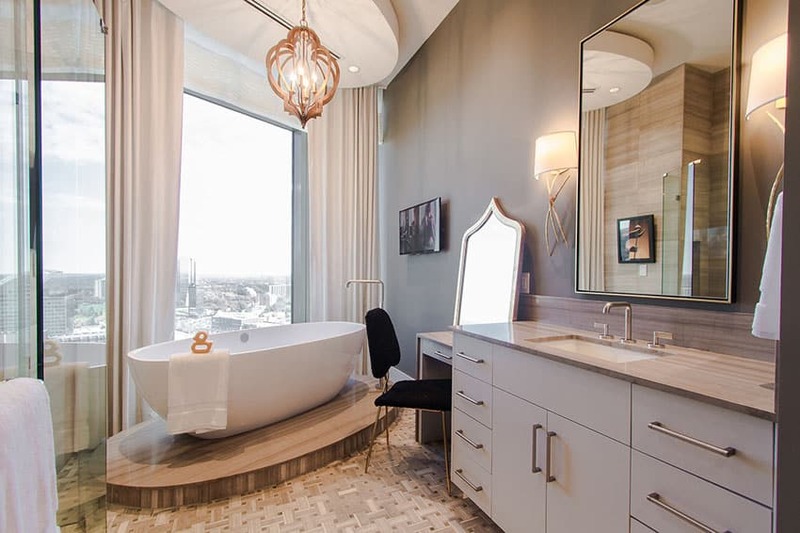 This master bath is adorned with floor to ceiling brown glass mosaic tile from Bangkok and provides a spectacular view of the outside from the tub. The tub itself is a Salon Spa whirlpool bathtub that has a travertine surround. 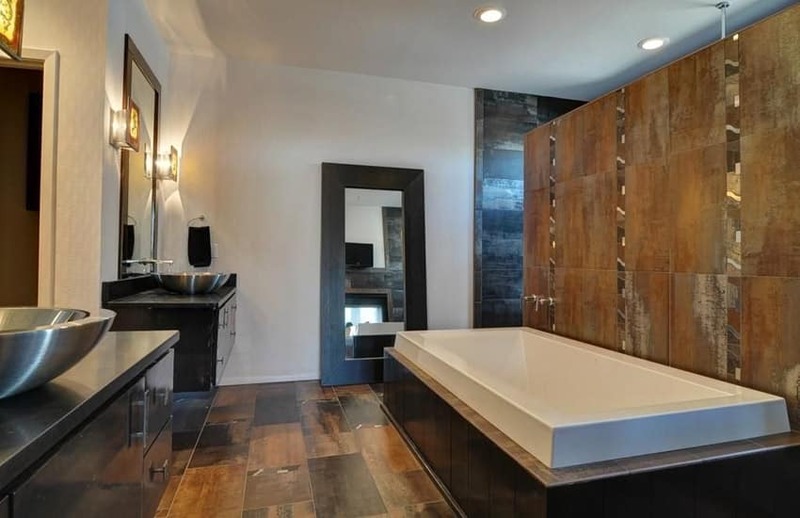 This stylish contemporary master bathroom has an impressive accent wall designed with Unique Tile Corten Copper porcelain tiles. 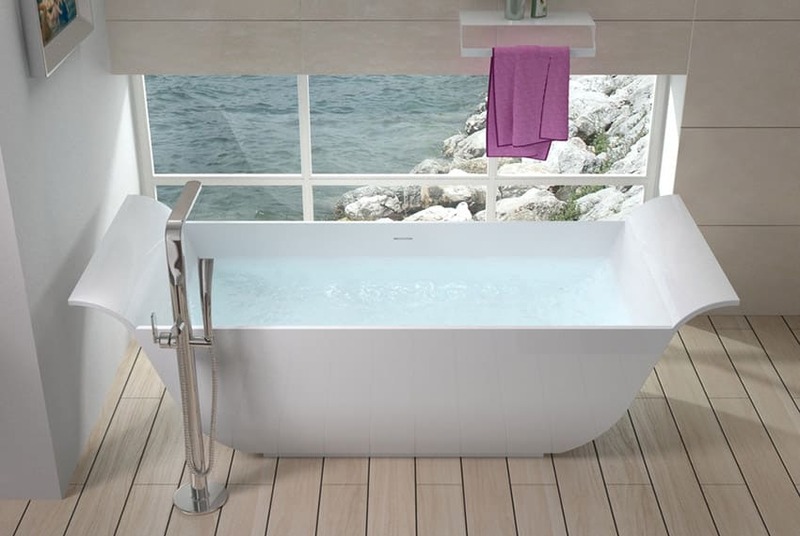 The Jacuzzi Luxury Pure Air Bathtub is the perfect spot to relax after a hard day. Other highlights of this space include the dual Decolav stainless steel vessel sinks with matching vanities and the large wall mirror. This traditional master bathroom is decked out for the romantic with rose petals along the tub’s edge, candlelight, and bouquet’s of fresh cut roses. 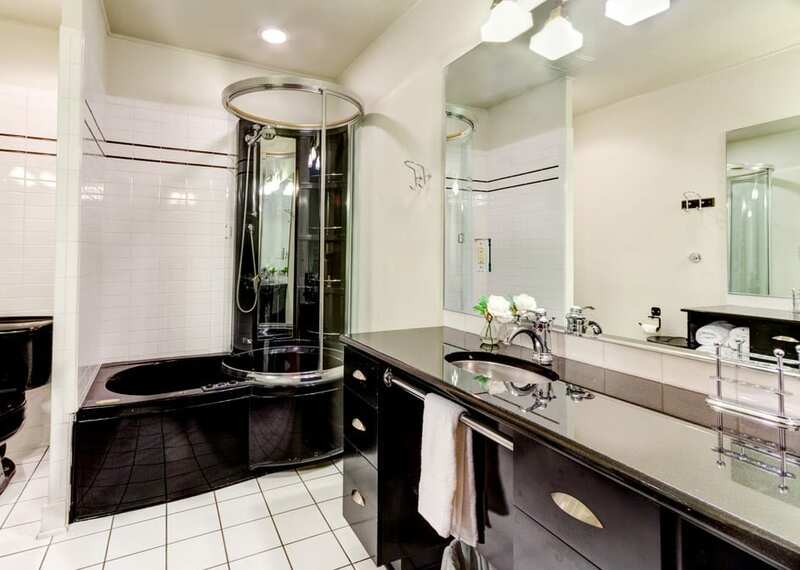 Attractive highlights here include the decorative wainscoting wall paneling, the dual vessel sinks and the Whirlpool SPA Massage Tub. The floor tile is a basket weave mosaic tile called Carrara White from Italy. This craftsman master bathroom offers an amazing custom handmade bathtub constructed from hammered copper. Continuing the theme on the vanity cabinet the sinks are also copper and sit on a slab of yellow granite. The flooring is a sand color ceramic tile. Two types of bronze wall sconces, antique copper water faucets and impressive bathroom chandelier lighting compliment this expertly designed bathroom. 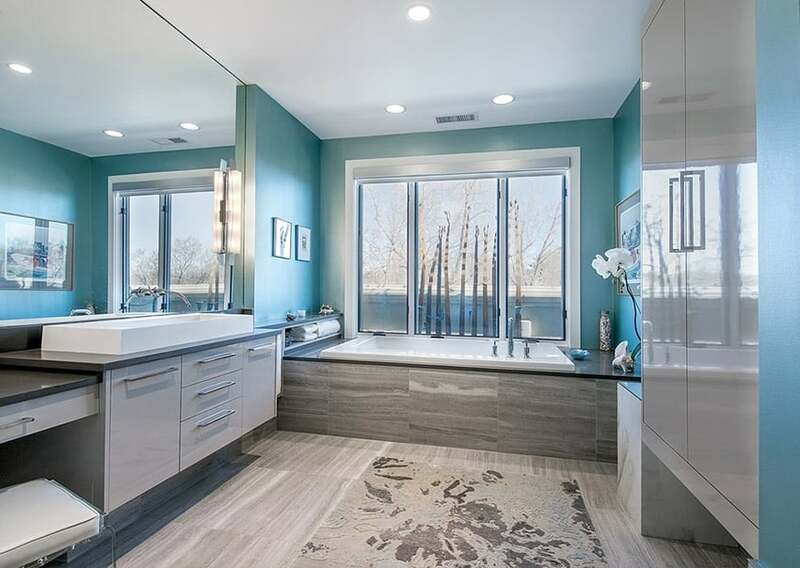 This contemporary master bath is bright with plenty of natural light from the large array of picture windows. It has floors of Calacatta Gold marble with white traditional style cabinetry vanity and an oval soaking tub. 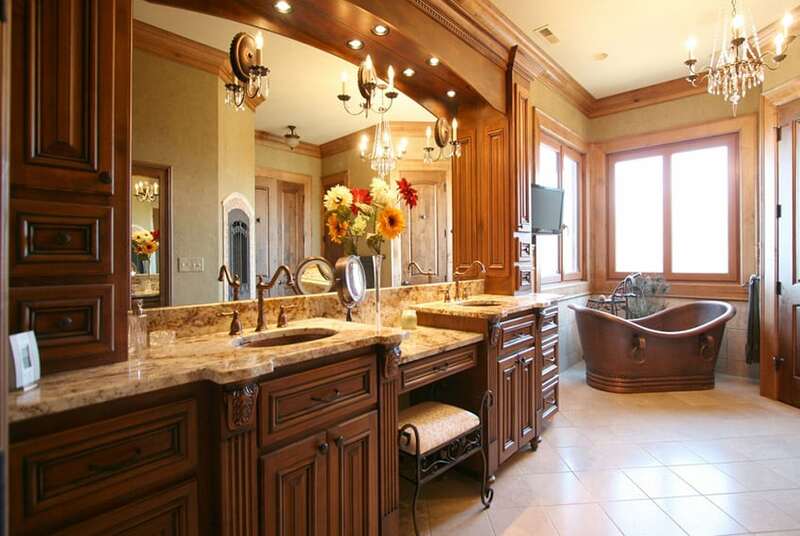 This regal looking master bath boasts large pillars on either side of the oversized jet tub. 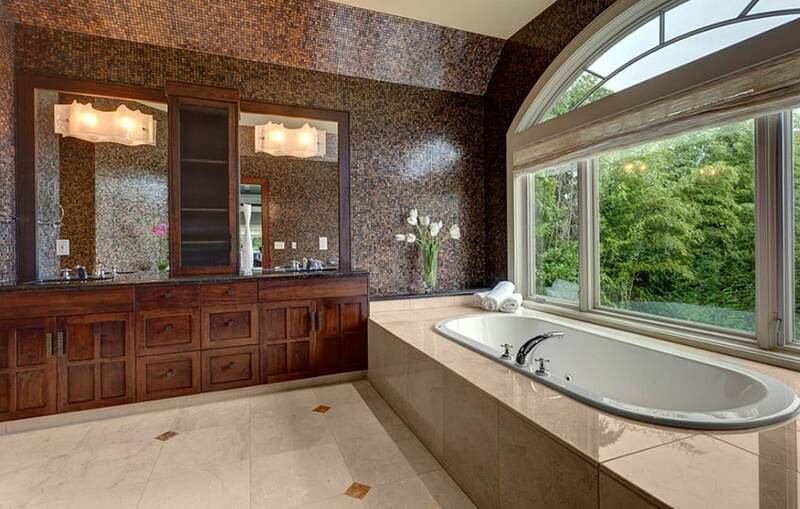 Countertops and bath surround are made of brown granite with porcelain floor tile. Elegant wall sconces and hanging lights in an antique finish match well with the overall brown and yellow theme of the room. 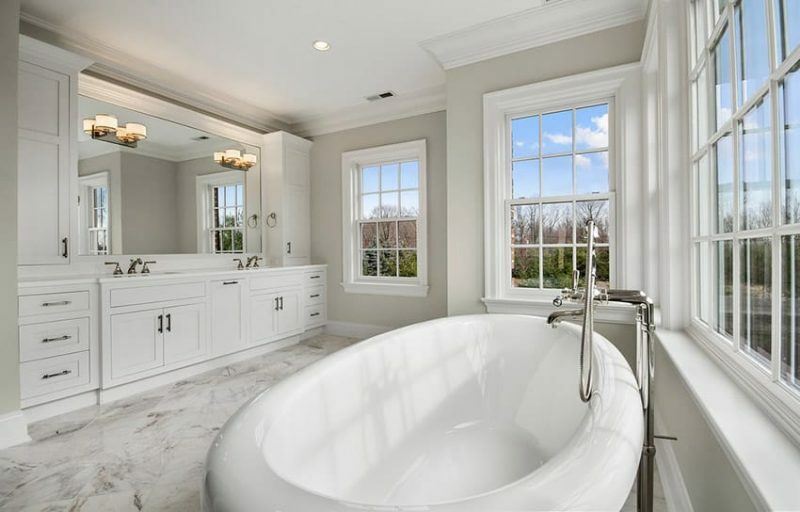 This expansive traditional mansion master bathroom has an impressive tall tray ceiling with columns and custom molding giving the appearance of an elegant spa retreat. 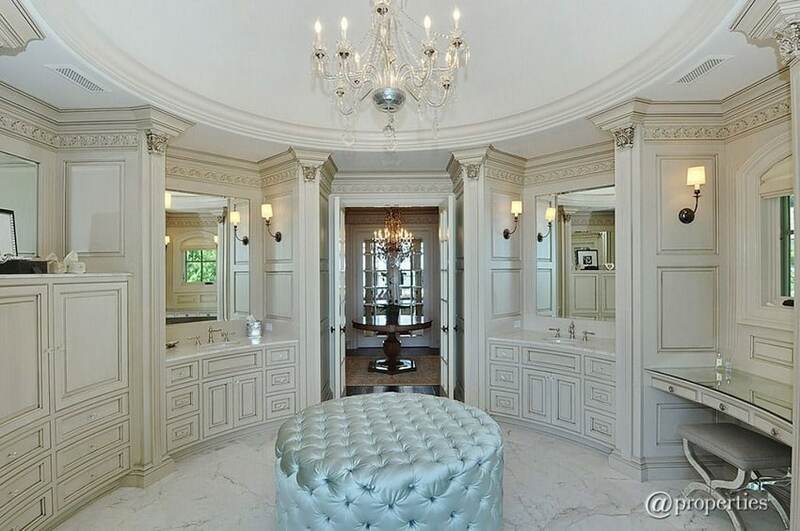 A tufted ottoman sits in front of beautiful French doors and is surrounded by cream color vanity cabinets. 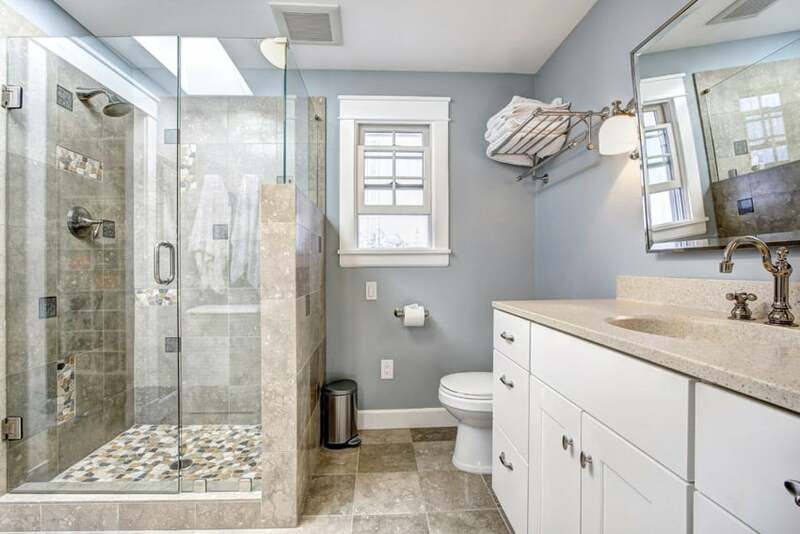 The large walk-in shower and step-up-tub offer plenty of opportunities for relaxation and renewal. 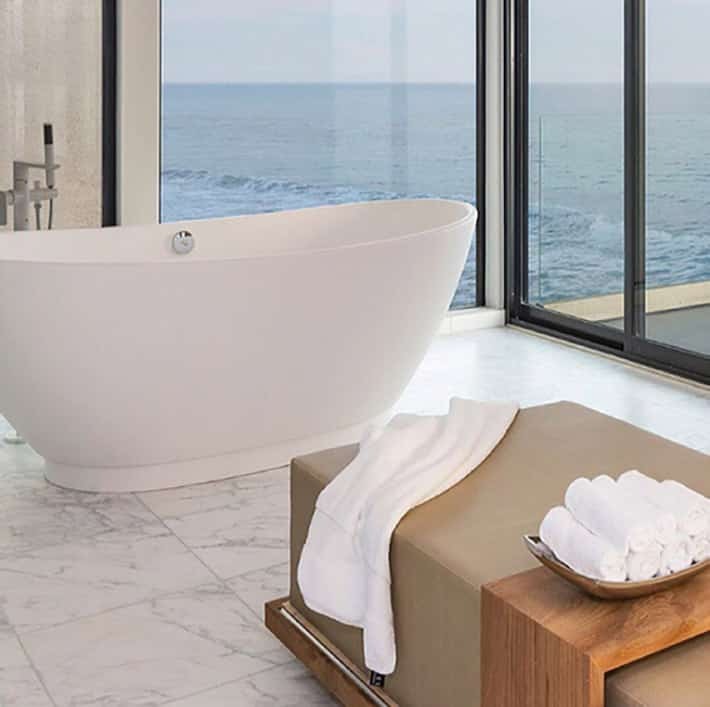 The solid surface soaking bath tub found in this bathroom rewards the user with an amazing waterfront view of the outdoors and shoreline. The faux wood porcelain tile provides the look of real wood with the durability of tile. 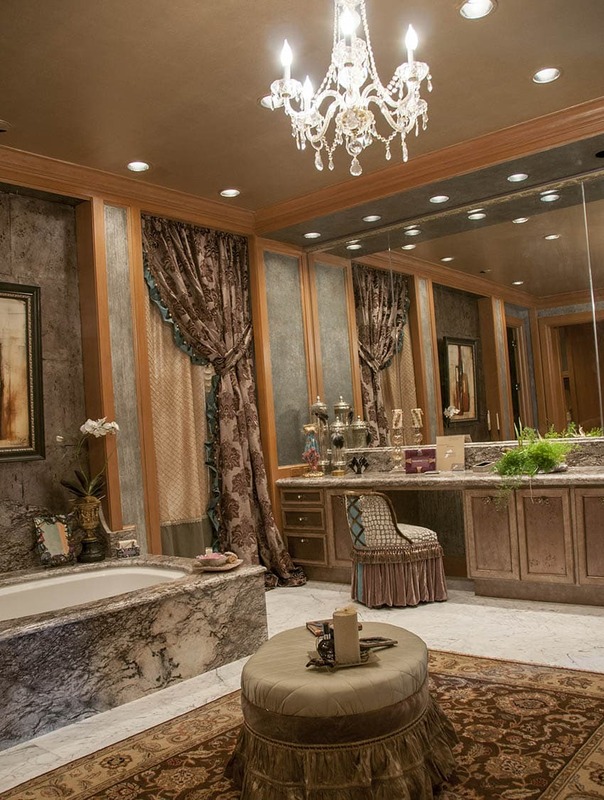 This upscale master bath is the perfect spa retreat with luxurious fixtures and decor. The dual sink vanity has a limestone counter with a wood base and compliments the chaise lounge and tub surround. Plenty of windows bring in the feeling of bathing outdoors and the large hanging chandelier provides a feeling of opulence. Textured concrete flooring matches the wall texture to bring together this architect’s finished design. This modern black and white bathroom design features an interesting frameless shower and bath combination. The bath area has traditional white tiles which contrast against the black of the shower enclosure, toilet and cabinets. The Mediterranean master bathroom shown here has traditional features such as the cream color vanity, and travertine flooring. 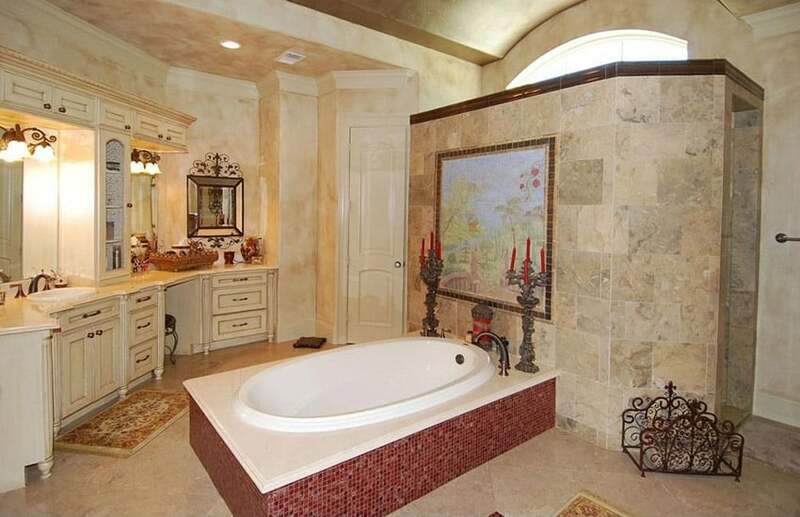 The large bathtub has a white marble tub top with a red mosiac tile surround. A high arched ceiling and skylight bring a dramatic feeling to the room. 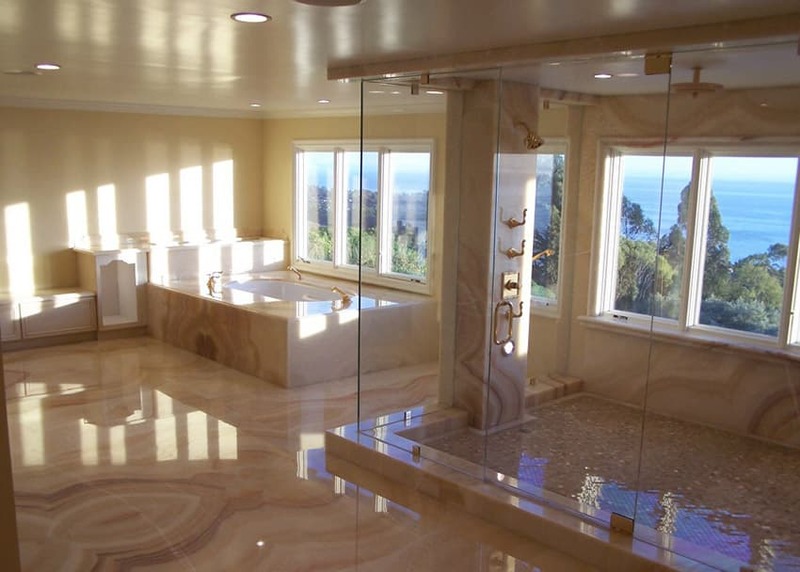 The white marble tile of this luxury bathroom offers a great spa like feeling to this oceanview space. The hardware Brielle resin freestanding tub sits in the corner where it can utilize the full effect of the view to maximize your enjoyment. A wood counter is within easy arm’s reach for towels and bath accessories you might need during your relaxing soak. 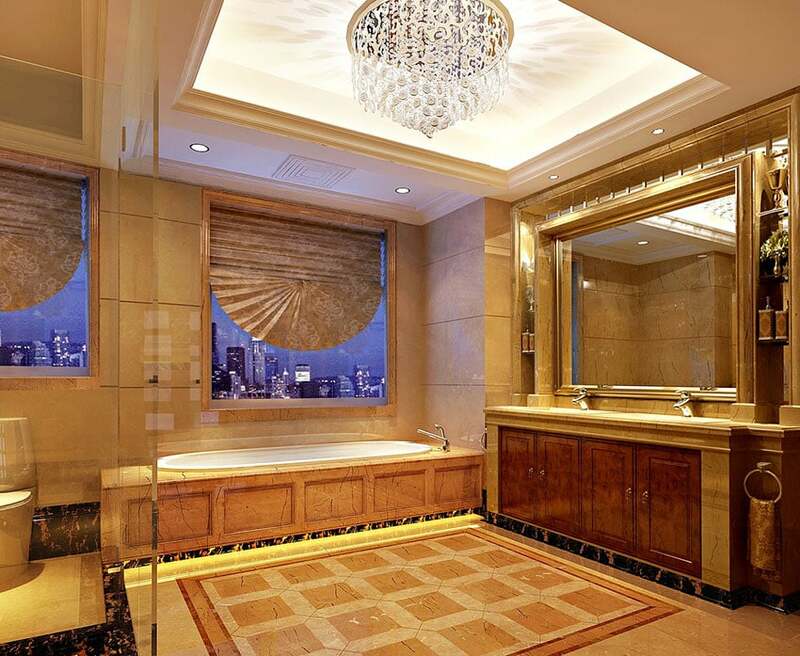 This grand bathroom demands attention with its gold and brown color scheme. The wash area looks extremely grand with its large golden framing that holds the big mirror and cherrywood cabinets. The floor is covered by warm oatmeal colored tiles, with the same quadrangle patterns with cracks on the bath tub. The toilet area is separated by a glass panel, and the boundaries are lines with beautiful black tiles with brown patches. The walls are also covered with oatmeal colored tiles, reflecting more light like the golden surfaces. A window lies directly above the toilet and bathtub, overlooking the skyscrapers. To help visualize and create your own designs take a look at out collection of the best bathroom remodel software. Using one of these programs you can use a picture of your own floor plan, to create a layout and try adding different colors, finishes and decor to discover your perfect design.